RIO DE JANEIRO, Apr 9 2013 (IPS) - Edson Godinho, a truck driver with 35 years’ experience, was lucky this time. When he reached the southeastern port of Santos in early April, the line of waiting trucks was much shorter than it had been earlier, so he only had to wait 12 hours to unload his soybeans. In previous weeks, many other truck drivers had had to wait more than 24 hours for access to unloading facilities in this port, where the majority of Brazilian agricultural exports are shipped. For several days the line of trucks was over 20 kilometres long. 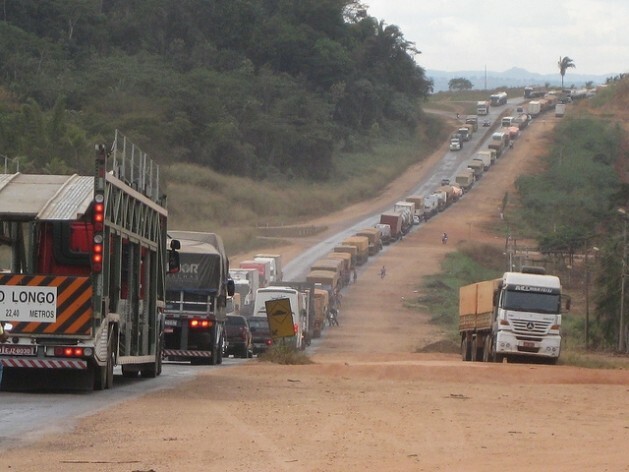 Ports are the bottleneck that contributes most to the “logistics blackout” – an inability to cope with increased traffic – predicted for this year of record agricultural production and exports, according to Marcos Jank, a professor at the University of São Paulo who is an expert in this sector. Grain production has more than doubled in Brazil since 1990, without improvement in agricultural logistics. Forecasts indicate that soybean and maize exports will grow 30 percent this year compared to 2012, reaching 41 and 25 million tonnes, respectively, and out-producing the United States. Soybean output will amount to 84 million tonnes this year, according to Agroconsult, a consultancy. Brazil’s overtaking the U.S. is partly due to drought in the United States, but also reflects a marked expansion of soybean cultivation, including in the semiarid Northeast. The rise in exports and heavy rains in January slowed shipments of maize, which accumulated in a backlog that affected soybean exports, blocking the ports of Santos and nearby Paranaguá, the main ports in the country, in March. The bottleneck will be felt again with sugarcane exports beginning this month, and with the new maize crop in July, Jank said. The chaos is not new, but it is getting worse. A bill to reform port activity regulations has been introduced by the government of President Dilma Rousseff, but congressional approval is uncertain, as more than 600 proposed amendments have been tabled. Large investments are also needed. “A definitive solution will take 10 years,” Jank said. “We have 21st century agriculture and 19th century logistics,” he told IPS. Speedy relief from the obstacles, he said, will require the opening of waterways, expansion of railroads, paving of highways to the north, enlarging of river and sea ports in the north and expansion of storage facilities at sea terminals in the south. Santos, in the state of São Paulo, is 2,000 kilometres away from the main soybean producing area in the centre-west state of Mato Grosso, yet it handles nearly 60 percent of exports of the crop, most of which is hauled in by truck. Transporting each tonne of soybeans costs nearly 70 dollars more in Brazil than in the United States, analysts say, adding that this profit drain would cease if production were shipped from northern ports, which are closer to the crops and to the export markets. The predominance of trucks, which handle 60 percent of freight in Brazil, also makes the logistics more expensive. Godinho is one of almost 600,000 independent truckers on Brazil’s roads, many of which are potholed or unpaved. He usually hauls soybean and maize from an area near his home, in the city of Ituverava in São Paulo, to Santos, 480 kilometres further south, and carries fertilisers on the trip home. Without a return cargo, it wouldn’t be worth his while, because the road tolls cost 580 reals (290 dollars), almost as much as the fuel used by his truck, which carries up to 32 tonnes, he told IPS after unloading the soy at the port. On the positive side, the São Paulo highways he drives on are in good condition. “The tolls and the bandits” are a trucker’s worst enemies, he said, although he himself has not been robbed on the highway. “But many of my friends have,” said the 57-year-old, who reckons he has had “a good life,” but is glad his three children have chosen other trades. Congested ports are the tip of the iceberg, but the long logistical chain has many other bottlenecks. Volmar Michelon, the co-founder of Pedromar Transportes, a firm with 85 vehicles and a hundred employees, told IPS that his drivers “wait up to 48 hours to unload soybean” in Alto Araguaia, on the southeast border of Mato Grosso, on to freight cars that transport it 1,240 kilometres by rail to Santos. The time lost because of “lack of infrastructure for unloading, and lack of freight cars,” means the company wastes the opportunity of three more standard trips by the same truck, he complained. When this happens, there are thousands of vehicles parked by the side of the road, acting as enforced “storage,” he said. There is no shortage of trucks, as many analysts and the press claim, “but rather an excess,” as two or three vehicles are required to do the job of one because of the delays in loading and unloading and other obstacles, he said. Adding to their number without correcting the hurdles would definitely obstruct the highways, Michelon said. Pedromar Transportes was founded in 1981 in the south of Brazil, and moved with agricultural development towards the centre-west. In 2001 the firm settled in Rondonópolis, a commercial and industrial city in the southeast of Mato Grosso. The company’s trucks operate only within the state, which is the largest grain producer in the country. Between 1950 and 1980, Brazilian governments built thousands of kilometres of roads, to serve agricultural development in the west and north of the country. This led to waves of migration, deforestation, malaria and land tenure conflicts. But agribusiness, and especially the boom in soybean production, did not precisely follow the highways, and now requires a logistics infrastructure that would provide less costly access to its markets, especially export markets.